detail of ceramic works by recent students from a range of courses. From left to right; Ali Hutton, Kay Bazley, Katherine Kennedy, Peter Lewis, Raku firing, Ilona Ede. Do you have an interest in hand-built and wheel-formed ceramics? 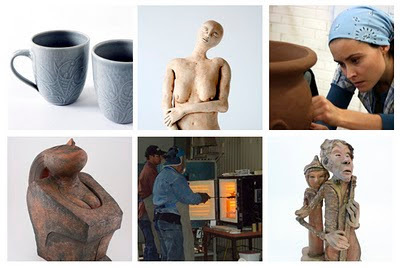 The Certificate III in Ceramics is a full-time, 3 day per week ceramic speciality course, which is completed over 1 year, and an information and assessment session is being held at the Nepean Arts and Design Centre on Thursday December 8 at 12.30pm. The Certificate III in Ceramics will equip you with the skills, knowledge and experience in a range of ceramic techniques including the use of the pottery wheel, the hand-building of sculptural work, mold-making, surface decoration, glaze technologies and kilns and firing. For those with an interest in working with clay, this is a fantastic opportunity to gain comprehensive skills in many aspects of ceramics. Why not join other like-minded people in the best ceramic art facilities in Western Sydney? For full details, including course fees, location of enrolments and units covered, visit our course information page, and click on the link for Certificate III in ceramics. This will take you to an information leaflet for the course. Bookmark the course info page for the latest info on all our courses on offer in the Fine Arts section. To register your interest in the course, you can visit the link below. You can also phone the college (131 870) and register over the phone. You be required to attend information session on Thursday 8 December at 10am in room C1.09 at Nepean College, Kingswood Campus, 12-44 O’Connell Street Kingswood (enter via gate 2). Click here for a map and instructions on how to find us. For more news and views from the ceramics department at The Nepean Arts and Design Centre, visit the ceramicsnepean wiki.